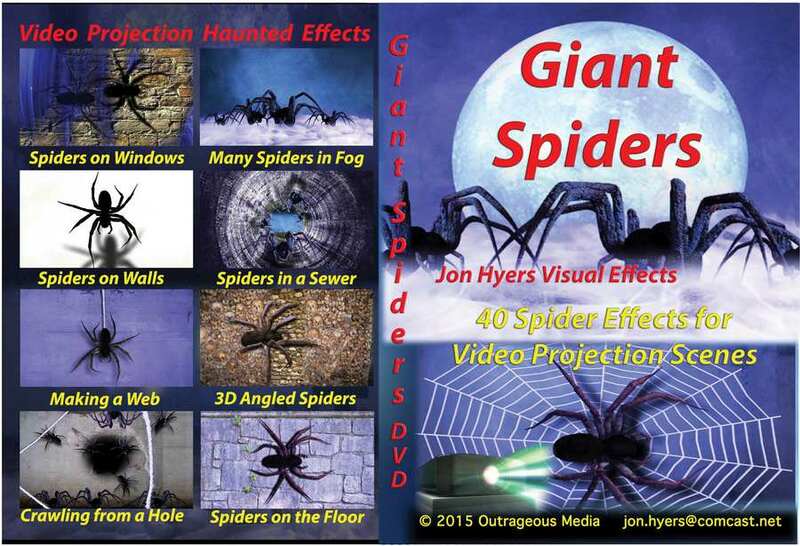 Project Virtual 3D Giant Spiders crawling from a hole in a cement wall, or in a sewer, or in fog! With more than 40 Effects Chapters, Giant Spiders will be sure to scare the neighbors. Using a video projector and a white cloth or projection screen, you can fill your windows with creepy Spiders, or project the Spiders directly onto a wall or the ground. You get single and multiple Spiders that are large, extra-large, and HUGE. Choosing the white background allows you to project the Spiders directly onto a wall or the ground, and the white light around the Spiders illuminates your wall without additional lighting. Choosing black backgrounds let you project the Spiders onto your white cloth or projection screen along with a variety of backgrounds. Where appropriate, many of the spider scenes also come in a soft-edge matted version.